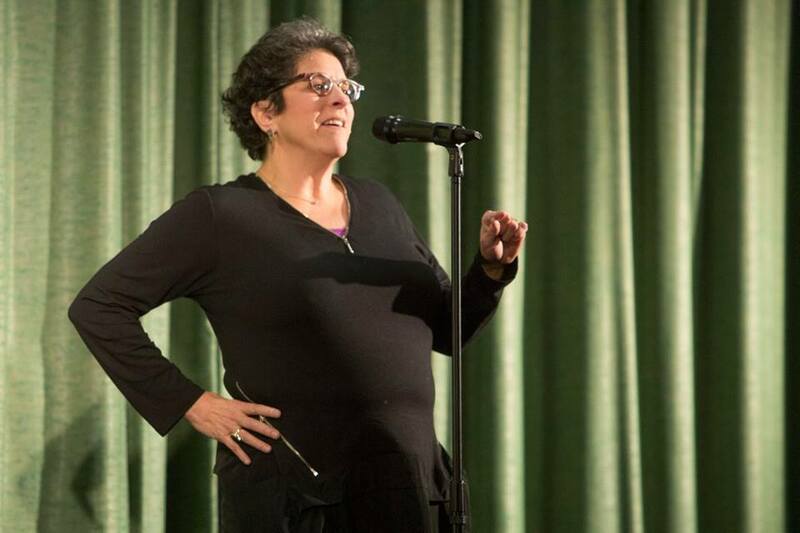 Peck on stage at the Perfect Storm StorySlam on December 14, 2016. Magda Peck first took to an Ex Fabula stage at a Secret Fabula event in March 26. We asked Magda a few questions and had no idea what we’d uncover. Have you done Storytelling or public speaking before? I’ve never told actual, personal stories where I was timed before. I’m a novice and I find the anonymity of the StorySlams refreshing. No one knew who I was. In my professional life, I’m “Dr. Peck” and used to giving presentations and paid speeches to crowds of thousands on topics I’m a leader in. But I love that there are no bios. I’m just one of the audience. Oh, it’s so very important. Stories are the anecdote to fear and the catalyst that ignites connection. What’s something we wouldn’t know about you? Well, I had to call you back because I was just coming in from the Women’s March in Madison. It was an amazing event. I remember the Civil Rights Movement and I felt a lot of the energy and momentum. In fact, I spoke at the Martin Luther King Jr. Celebration (at MLK Library, as part of an event featuring Season 8 Fellows) and shared how my parents dragged 9-year-old-me to the 1963 March on Washington. I was there for the “I Have a Dream” speech. We look forward to hearing the secrets that Magda has in store for us this Saturday. Last, but certainly not least, is a Storytelling Duo who stole our hearts at November’s “It’s Complicated” StorySlam. On Saturday, Amie Losi and Tom Wilke will perform a “Terkel” (interview format). Tom, you and Amie performed a Terkel at in November. 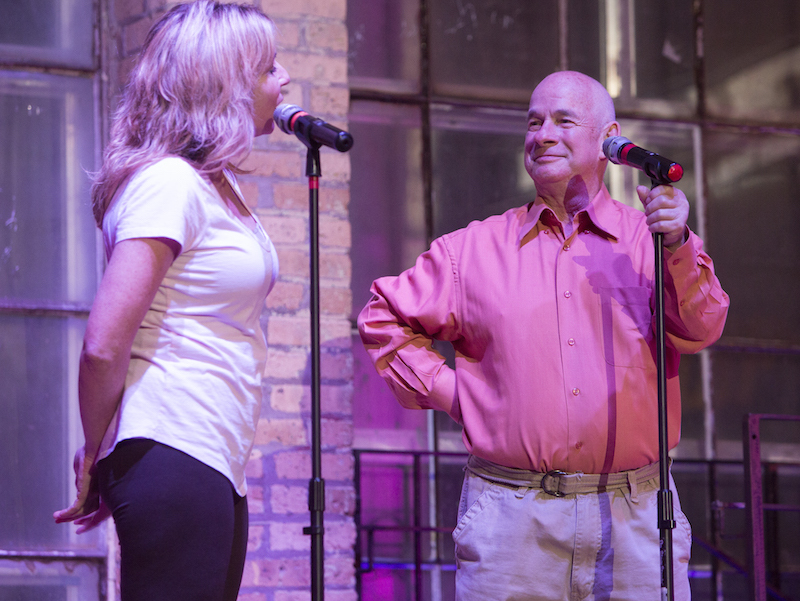 Were you excited to get on stage or did Amie have to talk you into it? Of course I loved being on stage. I was in plays and I used to play the viola. When I told the story with Amie I got to take two bows and people were giving me high fives. I loved it. Amie, how did you and Tom meet? Amie and Tom share a “Terkel” format story. Photo by Art Montes. Tom and I met last year. I was working for a home health care company and they asked me if I’d like to drive a man to the gym twice a week. I said yes and instead of just driving him to the gym, we became friends. Why do you feel Storytelling is important? 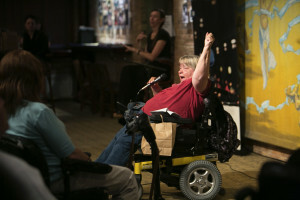 Amie: I love the cathartic feeling of sharing something with a crowd of people you’ve never met and having them listen. Tom: It’s important to tell people about your life ’cause all people are different. Tom: Hank the Brewers Mascot and Brett Favre. Well folks, we really do have one Spectacular line up. We can’t wait for them to share their secrets with you. Don’t have tickets? Head on over to https://www.exfabula.org/tickets/ for yours today.